Sierra Railway number 30 is perhaps one of the Pacific Locomotive Association’s most historic pieces of railroad equipment. Not only does she have a unique history of her own before becoming part of the collection, but she has played an important part in the formation of the association, dating all the way back to its founding in 1961. Baldwin Locomotive Works completed locomotive number 30 in May, 1922 for the Sierra Railway Company of California. She is slightly smaller than the common Baldwin-built logging 2-6-2. The locomotive was built for service on the railroad’s branch line to Angels Camp in Calaveras County, which opened for service in September, 1902. The line had hardly a single straight section of track its entire 19.3 miles from Jamestown to Angels Camp. In some places, curves reached a maximum of 29 degrees, while grades topped out at 4.26 percent. Near the town of Melones, the Sierra encountered the Stanislaus River Canyon, which necessitated the use of four switchbacks to keep grades at a minimum. The Angels Branch was a very steep and crooked railroad for such a diminutive 2-6-2! 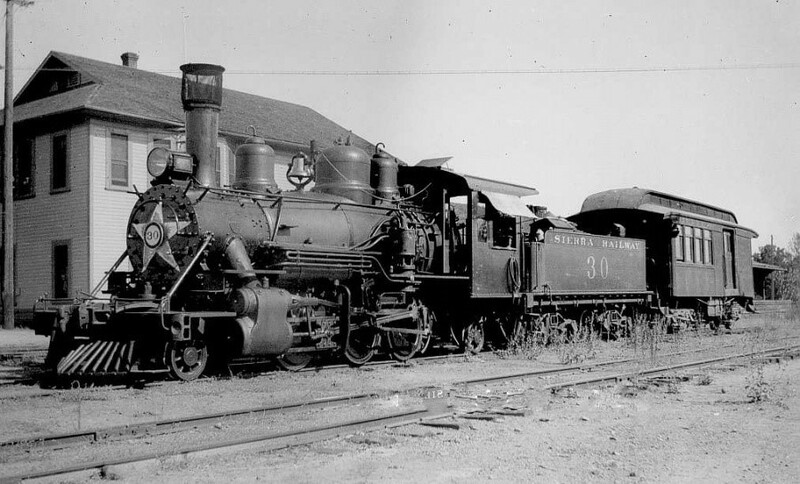 The number 30 was specifically built for the Angels Branch, which, until the locomotive’s arrival, had operated solely using geared locomotives, such as Sierra’s Shay #12, which is also part of the Association’s collection. Within two years of the number 30’s arrival in 1922, the Sierra sold their last Shay, number 12, to the Pickering Lumber Company, ending the use of geared power on the Sierra Railway. When the number 30 arrived on the Sierra, she was assigned to an eccentric young engineer by the name of Gus Swanson. Gus was said to be a highly unusual fellow, who might at times be seen drying his laundry from the cab of the locomotive, or blasting musical tones on the locomotive’s whistle. One of the number 30’s most unique features was a large silver star, painted on the engine’s smokebox door by Gus, thus giving her the nickname “Old Star”. The peculiar engineer and the number 30 spent most of their time working the Angels Branch, but would often perform switching moves in the Jamestown yard, or operate extra trains further up the main line to Sonora or Tuolumne during layovers. The number 30 and the quirky Sierra engineer worked the Angels Branch together so often that the regular train to Angels Camp was unofficially dubbed “Gus’ Special”. On February 28th, 1935, Gus and Sierra number 30 ran their last revenue train to and from Angels Camp, effectively ending the era of the railroad in Calaveras County. After her service on the line to Angels was over, the number 30 operated only sparingly. In 1935, the number 30 and sister Prairie-type number 32 were reassigned to operate on the Hetch Hetchy Railroad, which the Sierra had leased to transport construction materials to raise the O’Shaughnessy Dam. After the locomotive had outlived her usefulness on Sierra rails, she was sold on September 18th, 1937 to the Howard Terminal Railway in Oakland. Initially, the only the changes made to the locomotive were the substitution of footboards for the pilot and her new number, “6”. However, within a year the locomotive was rebuilt by the Western Pacific into a 2-6-2T tank engine, and the tender was scrapped. In addition to that work, the firing valves and water glass were moved to the engineer’s side of the cab, so that the locomotive could be operated by one man. Howard Terminal number 6 spent the next 25 years operating along the Oakland waterfront. When Howard Terminal acquired diesel number 8, all of the steam locomotives were scrapped with the exception of the number 6, which was retained for reserve service. Although the locomotive was in standby, she saw considerable service over the next fifteen years, either when number 8 was down for repairs or traffic was extra heavy. By 1961, the number 6 was the last steam locomotive in the Bay Area to see occasional revenue service. It was in May of that year that number 6 was chartered to pull a Western Pacific caboose over the railroad for a number photographers. The excursion would be the first of two such trips organized by the Pacific Locomotive Association’s founding members. The organization was officially founded two months later. In early 1962, number 6 was chartered again to pull the PLA’s first excursion for photographers with an operating steam locomotive. This event turned out to be her last operation over the Howard Terminal Railway. Later that same year, the number 6 became the first piece of railroad equipment acquired by the association. The locomotive remained in storage at Howard Terminal for the next three years. In 1966, she was moved to Crow Canyon park in Castro Valley. It was at this location that PLA members began restoring the locomotive to service. While undergoing restoration at the park, number 6 was steamed up twice, although no attempt was made to move the locomotive (there was only fifty feet of track under the engine at the time). In 1967, the Pacific Locomotive Association made the necessary arrangements for use of the Castro Point Railway in Richmond. However, it would be two more years before the track and roadbed could handle a locomotive. On May 15th, 1969, number 6 was trucked from Crow Canyon park to Castro Point. She was not the first piece of railroad equipment to arrive on the property, but she was the first to operate. Two weeks after being unloaded at Castro Point, the number 6 was steamed up and operated for the first time by members of the PLA. In addition to testing the locomotive, she was used to switch all of the equipment that had been moved into Castro Point during the first two years we had been at that location. Shortly after number 6 became the first to operate at Castro Point, she was joined by Steptoe Valley 0-4-0T number 3 and Pickering Lumber Corporation Heisler number 5. Despite the additional motive power, number 6 continued to be the primary locomotive in operation at Castro Point in 1970, 1971, and early 1972. The one major problem with the continued operation of the number 6 was her limited water capacity. The small split-saddle tanks were designed for limited switching along the Oakland waterfront, and not the steady use of hauling passengers, as was being done at Castro Point. A solution was presented by member Joe Ward to alleviate the problem. Joe was attending college in San Luis Obispo, and in his spare time would photograph the Santa Maria Valley Railroad. While doing so, he noticed a tender from one of the railroad’s former steam locomotives in a scrap yard. It took some negotiations, but eventually Joe had arranged for the donation of the tender to the Association, and also arranged its transportation to Castro Point. Once the tender arrived, it was immediately repainted and coupled to the number 6. In May, 1972, the number 6 turned fifty, and a party was held in the locomotive’s honor. This event became the last time she would operate at Castro Point. Following the event, it was discovered that major work was necessary in regard to the front flue sheet. While awaiting those repairs, crew members realized that the cylinder valve had been badly damaged (probably while working at Howard Terminal). By this time, Heisler number 5 had become a reliable locomotive, and work on Quincy Railroad Co. number 2 was in progress, so the repairs to number 6 became a low priority. As time passed, “Bones” Andrews spent a considerable amount of time restoring the locomotive back to her original appearance as Sierra number 30. He replaced the footboards with a pilot he manufactured, and rebuilt the cab to its original configuration. Lastly, he removed and replaced the rear coupler with a new drawbar and buffers in order to permanently couple the tender to the locomotive. The split-saddle tanks from her days as a tank engine were removed and scrapped, and she was reinstated with her original number of “30”. With the end of the Castro Point operation in December, 1985, most of the rail equipment and locomotives were moved out in the following two years. However, number 30 was not in a condition to move on her own wheels, so she stayed behind with Central Pacific number 233. In 1989, all of the remaining equipment at Castro Point was moved directly to the new operation at Niles Canyon. After further assessment on the number 30 was completed, the locomotive was disassembled for a complete overhaul. The boiler was removed, as were the flues, throttle linkages, and piping. Minimal work on the locomotive was done on the locomotive over the years, as the project slowly moved down the list of things to do. In 2012, an agreement was reached with the Oregon Coast Scenic Railroad to trade ownership of Pickering Lumber Corporation Heisler number 1 for the boiler work necessary for the number 30’s return to operation. In November of 2013, a new tender for the number 30 project arrived from the Black Hills Central Railroad in South Dakota. The tender will require modifications to match the number 30’s original tender, however it is in very good condition and is very similar to the original. As of 2014, the boiler is still yet to be completed, as is work on the cylinders, cab, frame, tender, and dozens of other parts and appliances. Work on the number 30 will likely not progress until the new locomotive maintenance facility is completed. However, the number 30 is the next scheduled steam locomotive restoration. She should be, as the PLA owes much of its early success to the locomotive. Should you have any doubt, take a look at the association’s letterhead, which symbolizes both the six founding members, and the number of the PLA’s first locomotive.